I ended up doing two Imbolc rituals this time. After writing about how I associate Freyr and Gerd with my own marriage, I decided it would be appropriate to include my husband in a ritual. He’s not as religious as I am, but he’s spiritual and open-minded. I don’t think he’d ever do rituals by himself; he’d rather just go for a hike, but he’ll participate in rituals with other people. I decided to do a ritual on Friday night with him, and if I felt like it, I’d do another solitary ritual later. I set up everything around the hearth again, just like with Yule. Earlier that day I baked a poppy seed cake for offerings. I’m supposed to offer cakes to the gods for Charming of the Plow, right? I thought that would be a good cake to offer, since it has seeds in it. I also got some milk, since Imbolc is associated with milk, and my husband wanted to include brandy. One thing I was soon reminded of is the big difference between doing a solitary ritual and leading a ritual for other people. I didn’t think it would be as big a deal with just my husband, but just like when I’ve led rituals before for groups of people, I found my mind primarily occupied with taking care of the other person, directing them on what to do next, explaining why we’re doing this or that, and worrying about whether they’re getting something out of it or are just bored with the whole thing. I never get a chance to commune with the spirits myself in those situations. Group rituals are different when you’re not leading them yourself, so you can relax. I’ve been to some really good group rituals that were very moving, but also to some that totally failed. Leading a successful ritual is very satisfying, though. It’s just satisfying in a different way than being a participant in one, or doing a solitary ritual. I think there’s value in all three. Anyway, when I did the ritual with my husband, I found myself skipping over some parts in the liturgy or losing my place a lot. This would probably be less of a problem if I had more practice with ADF style ritual. My husband didn’t even know how the ritual was “supposed” to go, so I don’t think it bothered him at all. For the offerings, we gave the fire a slice of cake, actually throwing it into the fire to burn up. We gave the tree an offering of milk, and the well an offering of brandy. The gods got more milk. When I took the Omen, I forgot what questions I was supposed to ask, since the February liturgy didn’t have them in there like the Yule one did. I ended up just asking, “Is there anything more you’d like us to know?” and got Sowilo, Hagalaz, and Nauthiz. Hmm, that doesn’t seem good. For the Working, I wanted to do something that would improve our job situations, since they’re both less than ideal. I’m underemployed, while my husband is working at an extremely stressful job. I blessed my laptop as a symbol of my job, and then we put together a mojo bag from a kit I got from Natural Magick to improve my husband’s job situation. He tucked it away deep into his briefcase. After the ritual, my husband said he liked it, and asked about the runes. I told him what each one meant, and he also got worried about Hagalaz. I told him that’s pretty much the worst rune in the Futhark. He asked how many runes are there, and I told him 24, so he said that sounds pretty bad if that’s the worst one out of 24. I told him Sowilo is one of the best, though, so maybe that will balance it out. Saturday we ended up spending most of the day working on my herb garden around the back porch, because it was such a beautiful day outside. I had planned on making a delicious roast chicken dinner, but by dinnertime we were both so tired, we ended up ordering pizza and watching Groundhog Day with Bill Murray on TV instead. I saved the chicken to make on Sunday, stuffing it with parsley, sage, rosemary, and thyme from the garden, and roasting it over potatoes, carrots, and onions. Holidays are all about food to me, after all! Monday was when I decided to do my solitary ritual. This semester I don’t have any classes to teach on Mondays, so it’s a day for me to work at home grading papers, preparing lessons, etc. After working most of the morning on that, I decided I had better get my solitary ritual done that afternoon while most of my neighbors were still at work, since I wanted to do it outside. One of the things both my husband and I love about this house (which we moved into almost exactly a year ago) is our 0.8 acre lot. Both of us wanted a BIG yard, with room for gardens, fruit trees, wild areas, and a ritual area. We made our ritual circle in the middle of the back yard, under a circle of trees, mostly live oaks, with some mountain laurels and a few other trees mixed in. It didn’t take me long to figure out that was the spot for our Sacred Grove. My husband is the one who ended up building the altar. 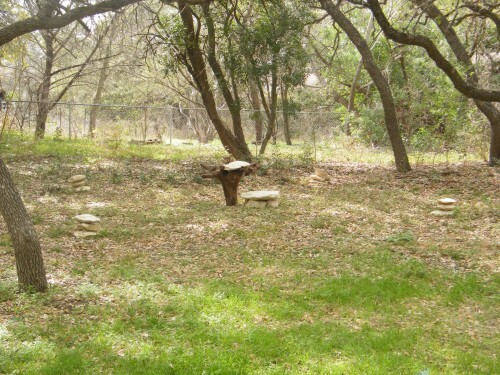 There was already this big oak stump in the yard, so he set it in the ground, upside down, with a flat rock on top. He was inspired by Seahenge, which also had an upside-down tree in the middle. He may not be that much into ritual, but he sure gets excited when it comes to building pagan things! We have plenty of limestone rocks here as well. I made another altar lower to the ground, underneath the stump, to give us more surface area. Right now we have cairns at each of the four directions, but eventually I’d like to make a complete circle with smaller rocks. I used a simpler setup for the ritual this time. 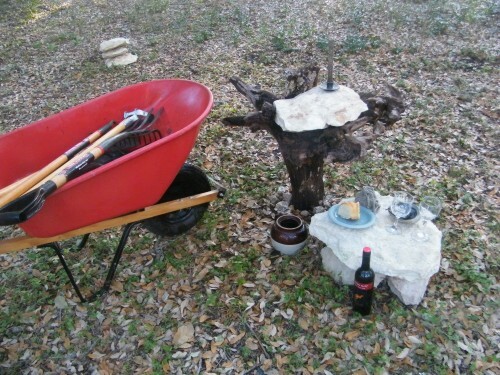 I put the bean pot I use for the Well on the ground by the tree stump, and a candle on top. The tree stump itself would be the World Tree, so I liked having the candle for the Upper World on top and the pot for the Lower World on the ground. I put the rest of my materials on the lower rock. We used up the last of our brandy on Friday, and I’m getting short on booze, but I found a bottle of sweet red wine to use. It was supposed to become mulled wine for Yule, but that never ended up happening, so I thought I might as well use it now. For the Working, I decided to do a Charming of the Plow with my garden tools. I gathered them all up, hosed the dirt off of them, and put them in my wheelbarrow. I’m really glad I found the time to do a second ritual, because this time I could really pause and feel the presence of the spirits. My only company was one of our cats lurking around the perimeter of the circle. I did get paranoid a few times when I heard cars drive by, worried that some of my neighbors might interrupt, but that never ended up happening. We have planted some understory shrubs around the ritual circle to eventually give us some privacy, but it will take a while for them to grow big enough. One thing that was really nice about doing this outside was all the birds singing. When I got to the Statement of Purpose, I went on about the cardinals, phoebes, chickadees, and doves singing all around me. Squirrels dashed around through the trees gathering materials for their nests. It really felt like spring was in the air! Having actual oaks all around me also helped with the Grounding and Centering. “I stand with the strength of an oak” is a lot easier to visualize when there’s an oak right in front of you. I offered cakes and wine, and left the cake out there on the ground. There’s a big, fat opossum that checks on the Sacred Grove at dawn every morning to see what offerings I’ve left for him to “clean up”. For the Omen this time I got Tiwaz, Nauthiz, and Uruz. There’s Nauthiz again. I hope that Uruz is there to give me strength to deal with whatever that Hagalaz business is. For the Working, I took a page from The Asatru Playbook (note: not an actual book) and saved some of my wine from the Blessing to bless my tools too. I used a sprig of rosemary from my garden to sprinkle wine all over them. I was going to just ask the gods to bless my work in the garden, but ended up saying things to Mother Earth, the land spirits, and the ancestors too. After all, I need the Earth and Nature’s blessing for garden success, and I only use heirloom seeds, which also honors the ancestors. My garden is very important to my spirituality, so I like having a holiday that’s all about that. I’d say that ritual turned out great. Next up is Ostara, a much more important holiday in the Germanic tradition, with lots more information to be found about it. It’s also pretty much the last holiday where it’s nice outside here in Texas. By May 1, things will have already started getting uncomfortably hot. Ostara will also be the same week as my first wedding anniversary, which is not a coincidence!